Monica Rose “Monnie” (Conlan) Fagnan – 97 – of Hornell passed away peacefully at her home early Thursday morning (April 11, 2019) surrounded by her children and loving caregivers. Born in Salamanca, NY on November 28, 1921, she was the daughter of Michael & Grace (Morrissey) Conlan. On January 27, 1941, Monica married Charles Joseph Fagnan in St. Patrick’s Church in Salamanca. She soon relocated to Hornell to raise her family (eventually consisting of seven children) and also to take care of both her parents until their deaths. Monnie loved her family especially her grandchildren, who she adored. She loved hearing about their activities and made sure she always had a photo album of updated pictures in her purse to share with friends. She loved sharing stories about her family and growing up and frequently made comments of “take things day for day”. Monica was a devoted Catholic faithfully reciting her prayers and supporting several needy charities. At the age of 90, her family gathered for a surprise birthday party attended by over 100 friends and family. She was totally in awe and loved sharing this special day with so many. She often kidded how she would live to be 100 and almost did. In addition to her parents Michael and Grace Conlan, Monica was preceded in death by her husband Charles J. Fagnan; sons Michael Fagnan and Charles (Chuck) Fagnan; grandson Christopher Dowdle; sister Celestine Birmingham; brothers Daniel Conlan, Thomas Conlan, James Conlan, Edward Conlan and Robert Conlan; as well as many nieces and nephews. 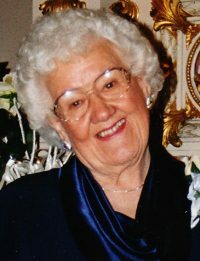 Monica is survived by her children, Yvonne (William) Fisher of Winter Springs, FL, Anita (Douglas) Dowdle of Brentwood, TN, ; Thomas (Nancy) Fagnan of Hornell; Michele (George) Scanlon of Rochester and John (Florence) Fagnan of Rochester; 17 grandchildren; 33 great-grandchildren; along with many nieces and nephews. The family of Monica Rose “Monnie” Fagnan will receive friends on Monday (April 22, 2019) from 3:00 PM – 6:00 PM at the Dagon Funeral Home 38 Church Street, Hornell NY. A mass of Christian burial will be celebrated on Tuesday (April 23, 2019) at 10:00AM at St. Ann’s Church with burial at St. Mary’s Cemetery. Monica’s family request that in lieu of flowers memorial contributions be made in her name to St. Ann’s Academy, PO Box 446, Hornell NY 14843 or Care First Hospice, 3805 Meads Creek Road Painted Post, NY 14870. Memorial forms will be available at the Dagon Funeral Home. Monnie was such a sweatheart. I have had the privalage of gelping take care of her for almost two years. She made us all laugh so much.The stories she would tell and the comments she made were so funny. We are all going to miss her greatly. We love you Monica Rose. My most sincere condolences to the Fagnan Family. Currently out of State and unable to express my sympathy in person. Monica was a great lady and the head of a wonderful loving family. The Fagnan`s and their wonderful Mom, remind me of my family and our wonderful Mom. Please celebrate her great life.